Accurascan is a document scanning OCR mobile app that has been developed by Accura Technolabs. The latter is a Singapore based R&D company that deals in real-time computer vision technology and accurate text recognition. OCR stands for Optical Character Recognition. With the help of this technology, we can streamline backend management and replace typing. The Accurascan app can scan a wide range of documents such as Passports, Visas, ID Cards, Driving License, Residential Permits etc. The demo or free version of the app can be easily downloaded from either Google Play Store or the App store. It is also available with monthly price plans which comes with a whole host of additional attributes. With its SDK, this app can be customized to suit unique business needs or integrated with third-party applications. There are several paid plans of this app which can be subscribed to after the completion of the free trial period, any of which can also be adopted by businessesthat are looking to create a paperless work environment. Which industries would benefit from Accurascan? 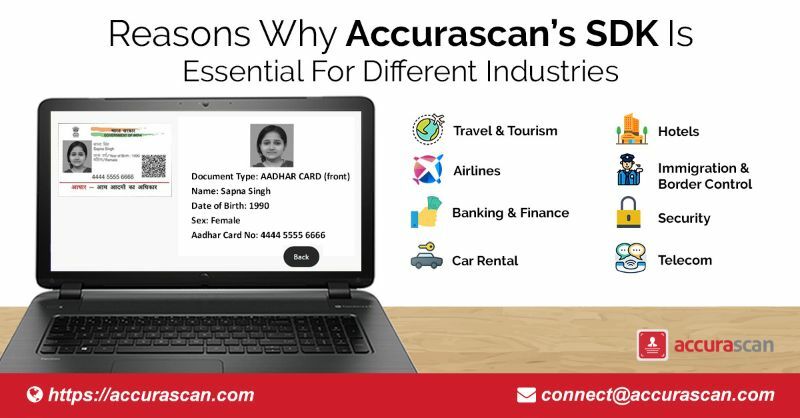 Accurascan has potential applications across multiple industries such as Travel and Tourism, Airlines, Banking & Finance, Car Rental, Hotels, Immigration & Border Control, Security, and Telecom. For example, in the travel & tourism industry, companies can drastically cut down on waste paper generation by eliminating the need for photocopies. Since the app scans passports within seconds, a large number of documents can be processed very fast. Since there is no longer any need for typing, it also removes the possibility of human errors creeping in. Furthermore, if an organization already has a travel app or website in place, the Accurascan engine can be fused with the same using its web SDK/API. Similarly, in the airlines industry, passports can be checked and processed in record time since the app works very fast. What is the Accurascan SDK and how can it help? The Accurascan SDK is a set of tools that help to enhance the attributes of the app or integrate with other third -party apps. With the help of the SDK, the Accurascan app can be easily customized to meet the unique requirements of any business model. This means that any organization that wants to adopt Accurascan need not spend a fortune coding new attributes into the app. Not only would this save a lot of money but it would also save a lot of time. For companies that already possess apps that are being used by them, the SDK allows Accurascan to be integrated with third-party applications. Again, this means that no additional substantial development work is needed in order to adopt Accurascan. This also saves a lot of branding time and money since no separate app needs to be launched and established in the market from scratch. As we can see, the Accurascan SDK is an important part of the app package. It enables the engine to be flexible and consequently much more appealing to potential customers. The SDK facilitates the easy and fast adoption of the product which in itself is a value-adding factor for any company.